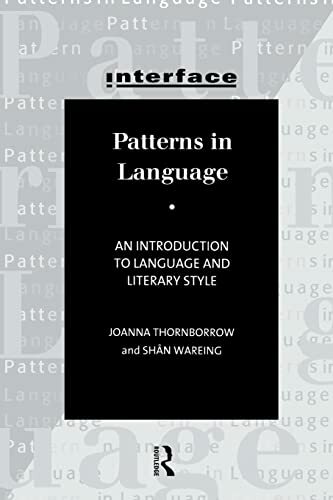 Patterns in Language addresses the real needs of students in modular systems who may not have a background either in traditional literature or in linguistic theory. This student-friendly textbook uses the principles of linguistic analysis to investigate the aesthetic use of language in literary (and non-literary) texts. Written in straightforward, accessible language with imaginative examples and humour, it shows how linguistic knowledge can enhance and enrich the analysis of texts. The authors borrow from traditional stylistics but focus primarily on the recurring linguistic patterns which are used by writers of poetry, fiction and drama. Textual examples include canonical literature and modern literary texts, as well as references to popular fiction, television and the language of advertising. Tasks, including textual analysis, are provided at every stage, and sample answers are also included.